Prototype: Class Litt. 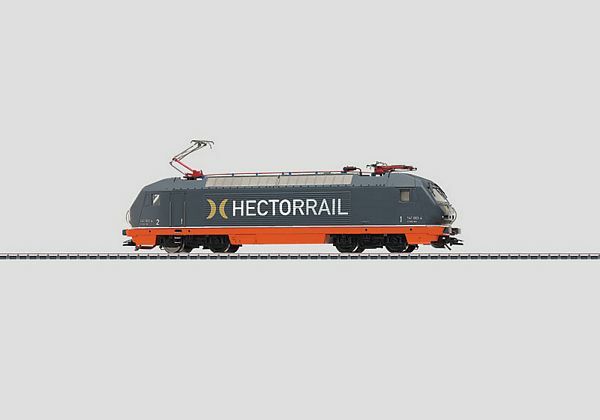 141 powerful express locomotive painted and lettered for the Swedish privately owned railroad firm Hectorrail. Built in 1997 by SGP, ELIN, and Siemens as a series of 3 prototypes. Road no. 141.003-4 "Starling". The locomotive looks as it currently looks in real life. Model: The locomotive has an mfx digital decoder. It also has a can motor with a 5-pole, skewed armature and a flywheel, centrally mounted. All 4 axles powered through cardan shafts. Traction tires. The locomotive frame is constructed of die-cast metal. The triple headlights and dual red marker lights change over with the direction of travel, will work in conventional operation, and can be controlled digitally. The headlights are maintenance-free, warm white LEDs and the marker lights are maintenance-free, red LEDs. The locomotive has separately applied grab irons and many other details. It also has detailed roof equipment. The engineer's cabs have interior details and a figure of a locomotive engineer in the front cab. The couplers can be replaced by closed end skirts. Brake hoses that can be installed on the locomotive are included. Length over the buffers 22.2 cm / 8-3/4. Can motor with a 5-pole skewed armature and a flywheel. Long distance lights can be turned on and off. Lights the end of Cab 2 and 1 can each be turned off separately. Maintenance-free, warm white LEDs for lights. This model can be found in a DC version in the Trix H0 assortment under item no. 22643.